Released at festivals in 2017 as The Third Wave, David Freyne's first narrative feature (now released as The Cured) nabbed not just Ellen Page (Hard Candy, Juno), who loved the script enough to sign on as both actor and producer, but terrific Irish actors Sam Keeley (In the Heart of the Sea) and Tom Vaughan-Lawlor (Peaky Blinders), as well. The film also sports a cool score, excellent cinematographry, and an interesting take on the tired zombie genre. You would think that all of the above would make The Cured a smash hit, but then you'd be wrong (or just have a differing opinion). There are so many elements of the film that alone, are great, but together, they simply don't gel, which is confusing. Is it the edit of the film, pacing issues, not enough varied shots, interference from unknown influences, or inexperience on the part of the director? A pass at IMDb tells me that he's done six short films and a television documentary, so inexperience shouldn't be the trouble, but who knows? As for the story, Ireland suffers from a zombie outbreak in which the zombies are now cured and integrating back into society. However, they're discriminated against by both the military and most of society, because that's what humans do when they fear something. There's legitimate pathos in here as friends and family are torn apart, and the acting on display is quite good, as is the script, but the film slogs during its first half. When I first heard that The Cured was an Irish production, I got excited. The region is known to produce compelling horror work, such as The Canal, A Dark Song, Let Us Prey, Grabbers, and the upcoming feature debut from Aislinn Clarke and IFC, The Devil's Doorway. I went in wanting to love The Cured, but I just couldn't. I do think that given time, Freyne will sharpen his skills; he has the talent. For a film with similar themes, check out the excellent The Girl With All The Gifts. The Cured Blu-ray looks and sounds fine, and it should, as The Cured is a brand new film. Features other than that are scant. 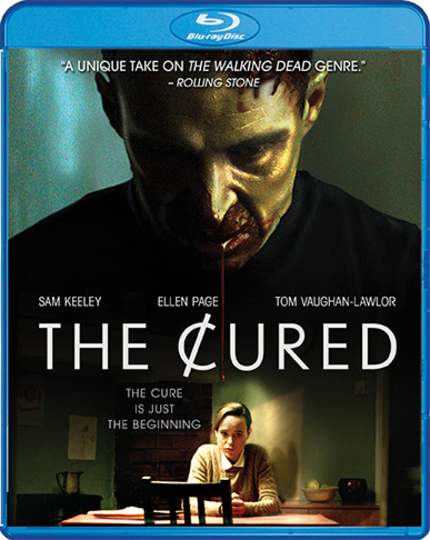 Scream Factory is releasing The Cured on DVD and Blu-ray in the U.S. on July 3; you can find out more and preorder the film here.